Made in Thailand and Active formula by Index International Group of Tokyo Japan. 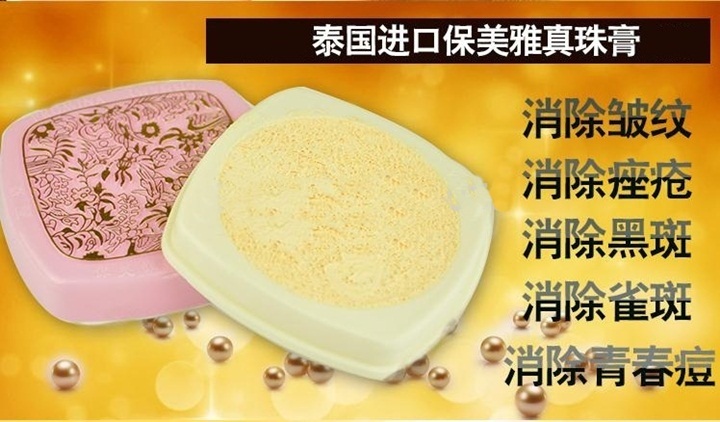 Promina Ginseng Pearl Cream is made by specialty scientifically method from active ingredients which efficacious against acne, freckles, dark spots and wrinkles and other face problems. -- The deep nourishment of the skin, leaving it moisturized. Announcement to all Promina Ginseng Pearl Cream user. The latest high tech ( RED SIGN - HONG LONG ) for protecting counterfeit products. 1. At normal room temperature 27*c - 30*c, use dry fingertip rub on ( RED SIGN - HONG LONG ) then it will change to gray color, once you stop rubbing the red sign, it will return to bright red again. -- then it will restore to bright red. 3. When store in air condition room, it will maintain original bright red.